Recently many customers call us with this kind of problem. It looks like it appears out of nowhere and many computer users get panicked and call this support number. It looks like genuine Microsoft support. In some cases it even speaks via your speakers. Please check our video below. The infection detected, indicate some recent downloads on the computer which in turn has created problems on the computer. 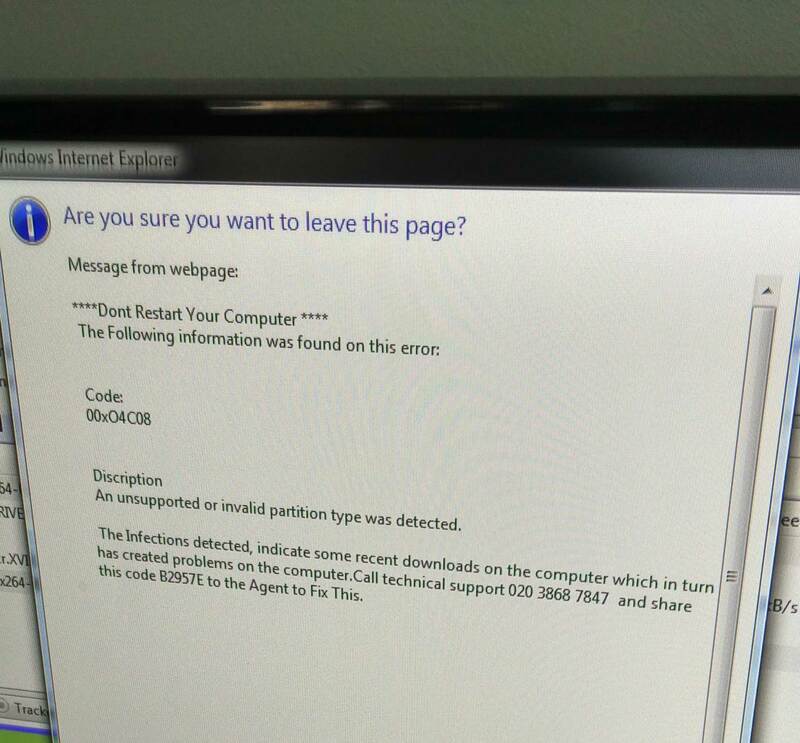 Call technical support 020 3868 7847 and share this code B2957E to the Agent to Fix This. First of all – DON’T PANIC. Next try to close this popup window. 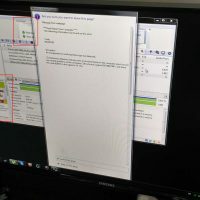 If you cannot do that – try to shutdown your computer. In case you are not able to do that – press turn off button for 5 seconds. DON’T CALL the number provided. This is SCAM. They will connect to your computer and then they will be able to upload real virus or trojan to your computer. After so called “repairs” they will ask for a payment. Computer repair London warns – never pay for that kind of services. Your card details will be stolen and they will take all available funds from your account. If you are advanced with computers – you can try to get rid of this rogueware yourself. It not – we recommend to turn your computer off and call reputable computer technician or computer repair company. Most probably you clicked on one of adverts that appear on many websites. Few customers reported that they get it after accidentally pressing on advert in torrent sharing software. We can only advice you to try not to click on unknown ads or visit poor reputation websites. Especially torrent sharing ones. I have Antivirus am I safe? NO. This alert is not an antivirus or trojan. 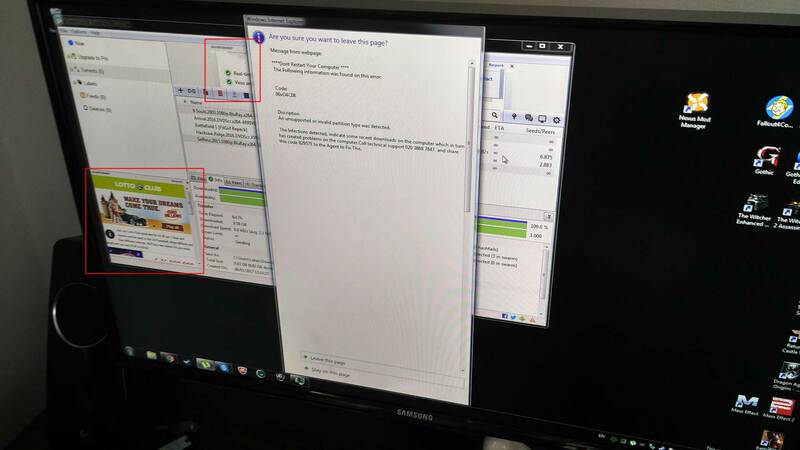 This is just rogueware which is not detected by any antivirus software yet. Proceed if you are advanced technician only. There is no tool for removing this kind alert as it can appear from ads on internet. First of all clean your all time browsing data temporary files. Scan your computer with malware scanning program. 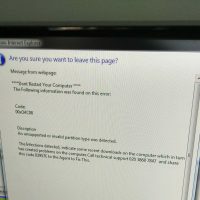 Sometimes it detects pop up malware and detele it from your computer. Best option to prevent it is to use adblocker for your browser and visit only good reputation websites. We know that it is not always possible. At least try to always use incognito mode. Bad websites will not store any spyware data on your laptop or desktop when you finish.